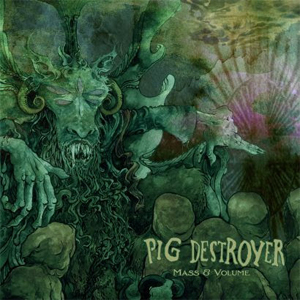 Last month, Grindcore Masters PIG DESTROYER announced plans to release a two song doom EP entitled Mass & Volume this fall. Previously available for a limited time as a digital only release with all of the proceeds going to the family of former Relapse Records employee Pat Egan, who tragically passed away last year, this cult release will now be available on physical formats for the first time ever. Today, PIG DESTROYER present the monolithic track "Red Tar" from the EP. Listen to "Red Tar" below. Written and recorded during the final hours of the sessions for 2007’s Phantom Limb LP, Mass & Volume finds PIG DESTROYER’s typically break neck speed virtually come to a grinding halt with two epic songs of crushing doom. The album will be available on October 14th in North America, October 13th in the UK/World and October 10th in Germany/Benelux/Finland. Mass & Volume will be limited to a one time press of 2000 CDs worldwide and a limited run of colored vinyl, each featuring the stunning cover art from legendary artist Arik Roper (HIGH ON FIRE, SLEEP). Additionally, the band has revealed more upcoming tour dates including shows with EYEHATEGOD, RINGWORM, DROPDEAD and FULL OF HELL in numerous cities that they have never before played. Check out a full list of dates below and stay tuned for more from PIG DESTROYER.